Unique golden wedding anniversary gift idea - a personalized 50th anniversary magazine cover starring the couple's photo with headlines featuring details of their life, family and relationship. A special gift that will bring a smile, a laugh, and be the hit of the celebration. The golden wedding anniversary, #50, is one that should be celebrated with class – and what’s more glamorous than a star-turn on a personalized 50th anniversary magazine cover. To make this unique personalized 50th anniversary gift, upload the couple’s original wedding photo or a more recent photo and then personalize the headlines to be all about their life together. Don’t forget to include happy memories and family members’ names. It’s simple to make a fake magazine cover at YourCover thanks to our easy to use online magazine cover generator. More than a fake magazine cover, a YourCover personalized magazine cover gives you the opportunity to be creative and include all the special things that you love about the recipients. You will be creating a silver wedding anniversary gift that’s as unique as the couple starring on the front cover. The unique back cover feature is available just in case you have a more photos and info than can fit on the front. Purchasing options provide you with a variety of choices so you can choose the personalized magazine cover product that is most convenient for you. Perhaps you need a last minute gift, then choose the photo file download for instant printing at home or if time is not an issue, let YourCover produce the photo print for you. We have beautiful frames to complete your gift as well as a gift service, and rush and international shipping are also available. 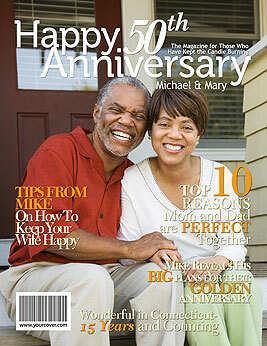 A wonderful memento to commemorate a milestone 50th anniversary, a YourCover personalized magazine cover is a unique 50th anniversary gift that will be cherished for many years to come! Make a fake magazine cover using the YourCover magazine cover generator.